Situated in Malaga province, at about 100 km from the capital, Ronda is perched on top of a rocky outcrop which gives picturesque views from nearly any part of the old town. Located at an altitude of 739m, a charming mountain road with beautiful views links Ronda with the Costa del Sol to the south. The old part of the town retains its Moorish influence, with narrow streets and a number of interesting historical buildings to visit. 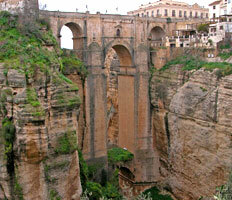 You could visit Ronda by booking a private taxi from Malaga Airport. With Malaga Airport Transfers you can book personalised excursions to Ronda in luxury cars and buses. At 120m deep Ronda's gorge separates the old part of the town from the new part. Three bridges span the gorge, of which the most famous one is "El Puente Nuevo", the New Bridge, although we heartily recommend you see "El Puente Viejo" (the Old Bridge), too. 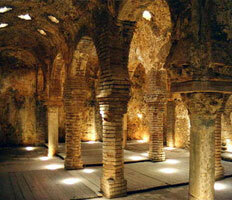 Here you will still notice the Moorish influence, with numerous interesting places to see such as the old Moorish baths (Baños Arabes) and the "House of the Moorish King" (La Casa del Rey Arabe). 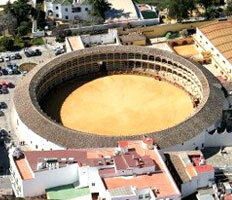 The "Plaza de Toros" is open to the public and contains an intriguing bullfighing museum. Bullfighting in Ronda only takes place once or twice a year, one of which includes the spectacular bullfight of the Goyesca fair in the first week of September, when the whole town recalls the 18th century days when Ronda was the country's most important bullfighting centre. During this fair you will see beautiful horse-drawn carriages and traditional costumes. Don't need any more convincing? 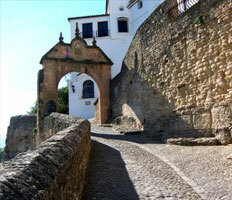 Use the form in the top of the page to find out our prices on cheap airport transfers to Ronda. Starting your holiday simply couldn’t be easier.